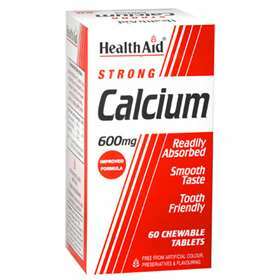 HealthAid Strong Calcium food supplement helps maintain strong, healthy bones and teeth and plays an important part in normal muscle function, including the heart, and nervous system. Health Aid Calcium also contains vitamin D3 and Inukin (FOS) for effective absorption by the body, maintain a healthy gut and give a great taste. Free from yeast, gluten, wheat, salt, artificial colour, preservatives and flavouring. Supports strength and health in bones and mussels. Helps vital body processes and efficient functionality. Useful for women during pregnancy and breast feeding when more calcium is needed. Helps the transmission of messages through the nervous system. Adults and children over 12 years of age, one tablet daily, can be increased to two tablets daily if required. Calcium Carbonate, Microcrystalline Cellulose, Inulin (Fructose oligosaccharide - FOS), Lemon Flavour, Stearic Acid*, Silicon Dioxide, Magnesium Stearate*, Sucralose powder, Vitamin D3 (Cholecalciferol).